Together, their collective musical philosophy and experience helped form Talking Ear while Cohen, Aukerman, Palmer and Maloney attended the University of Toledo in Toledo, Ohio. Bass player Ben Rolston, who recently moved to New York City, initially joined the group. That musical inspiration also allowed the band members to quickly forge strong friendships. In turn, their strong camaraderie is woven throughout their performances and interactions in the studio. After forming Talking Ear, the band started mastering Palmer’s music and compositions from the other members while recording their self-titled debut album, which was released in June. For Maloney, Aukerman and Cohen, the six-minute track, “Three with Larry, Five with Sherry,” epitomized the band’s journey to grow as an ensemble. Initially, the band felt unsure about the direction of the track while recording it, but later added synthesizers for Maloney and other elements of production. Another album favorite includes the calming “Dreams,” which features Cohen’s mystical jazz vocals against Palmer’s melodic guitar solo along with Maloney’s soothing piano and Aukerman’s delicate drums. Together, their jazz mastery transports audiences to a musical world hidden deep in the subconscious. As for Cohen, the album’s opening track, “Face It,” is her top pick. Composed by Maloney, the song introduces listeners to the band’s improvisational spirit that’s captured throughout the entire album. While Talking Ear enjoys reflecting on their past compositions and recordings, they’re getting ready to play some dates this winter, including a Feb. 16 show at Chicago’s Slate Arts and a Feb. 23 show at Cliff Bell’s in Detroit. 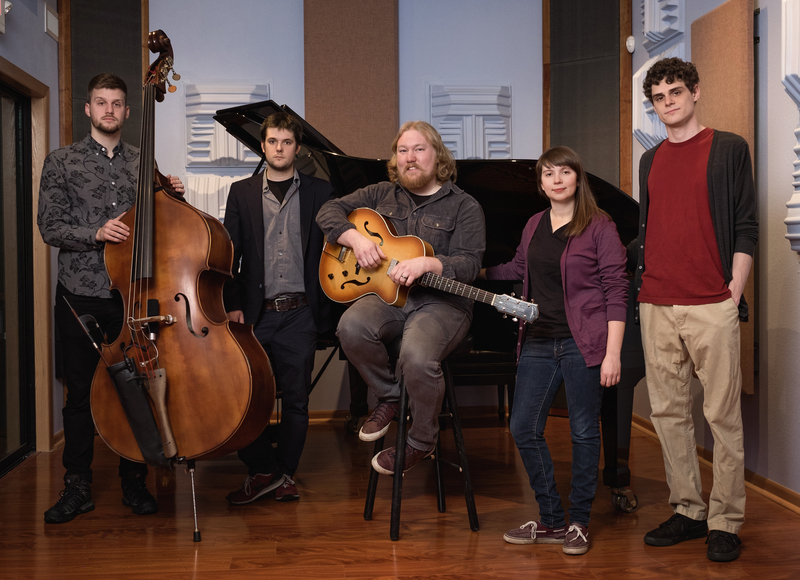 They’re also looking forward to making their next album and supporting other burgeoning Michigan and Ohio jazz acts, including the Estar Cohen Project, Galen Bundy’s Project 206, Molly Jones, Stephen Boegehold, Saajtak, Will Strickler and others.